Lesson 6. 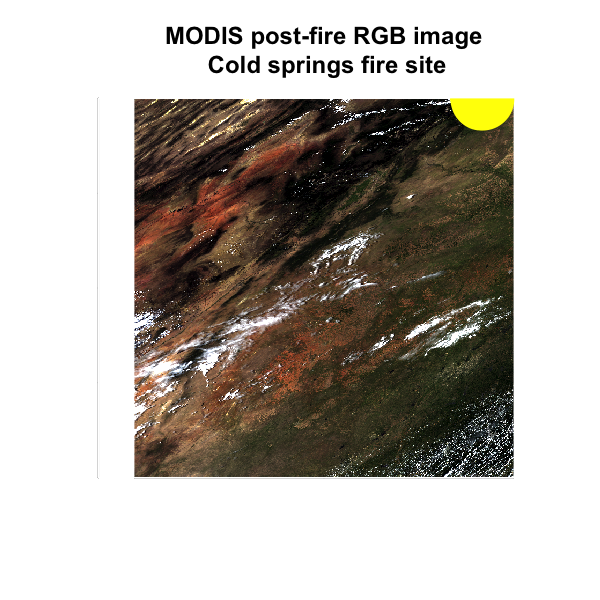 Work with MODIS Remote Sensing Data in R.
Open MODIS imagery in R.
Create NBR index using MODIS imagery in R.
Calculate total burned area in R.
First, let’s import MODIS data. Below notice that you have used a slightly different version of the list.files() pattern = argument. Let’s import your MODIS image stack. 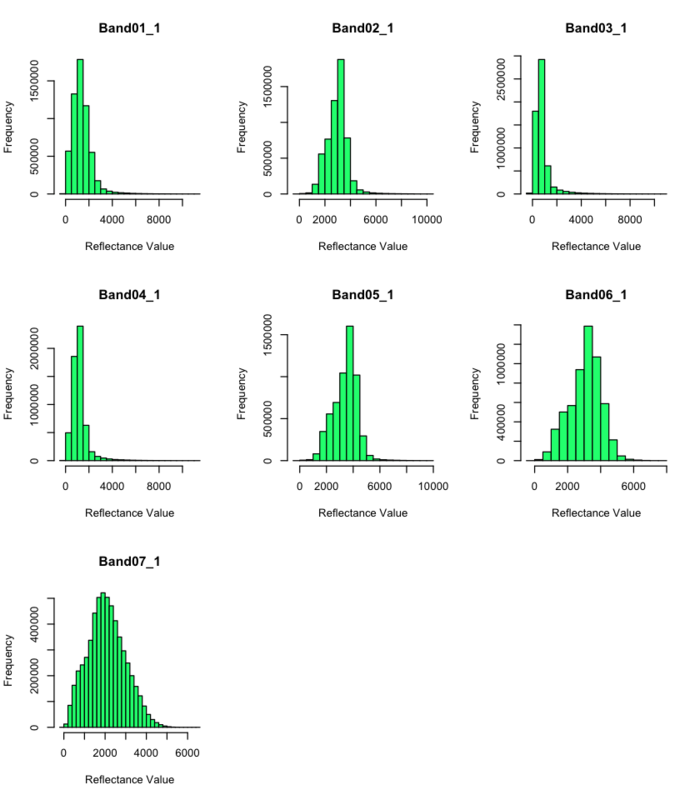 ##  "Band01_1" "Band02_1" "Band03_1" "Band04_1" "Band05_1" "Band06_1"
As you’ve learned in class, the normal range of reflectance values is 0-1 where 1 is the BRIGHTEST values and 0 is the darkest value. Have a close look at the min and max values in the second raster layer of your stack, above. What do you notice? The min and max values are widely outside of the expected range of 0-1 - min: -32768, max: 32767 What could be causing this? You need to better understand your data before you can work with it more. Have a look at the table in the MODIS users guide. The data that you are working with is the MOD09GA product. Look closely at the table on page 14 of the guide. Part of the table can be seen below. Click here to check out the MODIS user guide - check out page 14 for the MOD09GA table. Notice the valid values for the MOD09GA reflectance product. The range is -100 to 16000. What is valid range of values for your data? What is the scale factor associated with your data? 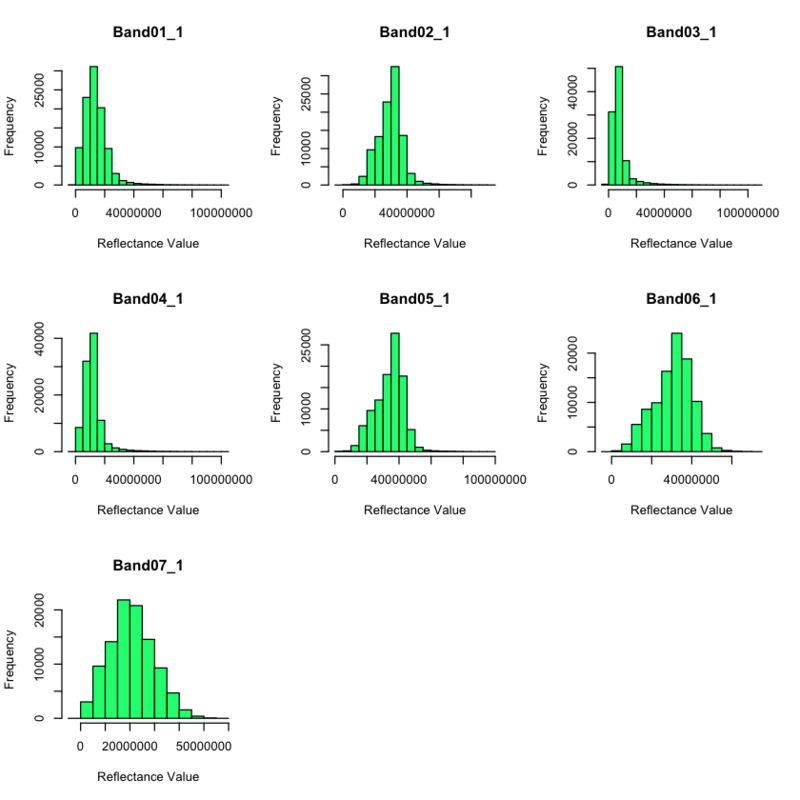 Looking at histograms of your data, you can see that the range of values is not what you’d expect. You’d expect values between -100 to 10000 yet instead you have much larger numbers. Looking at the metadata, you can see that your data have a scale factor. Let’s deal with that before doing anything else. The scale factor is .0001. This means you should multiple each layer by that value to get the actual reflectance values of the data. Great - now the range of values in your data appear more reasonable. Next, let’s get rid of data that are outside of the valid data range. Next, let’s deal with no data values. You can see that your data have a “fill” value of -28672 which you can presume to be missing data. But also you see that valid range values begin at -100. Let’s set all values less than -100 to NA to remove the extreme negative values that may impact out analysis. Next you plot MODIS layers. Use the MODIS band chart to figure out what bands you need to plot to create a RGB (true color) image. In the plot below, i’ve called attention to the AOI boundary with a yellow color. Why is it so hard to figure out where the study area is in this MODIS image? 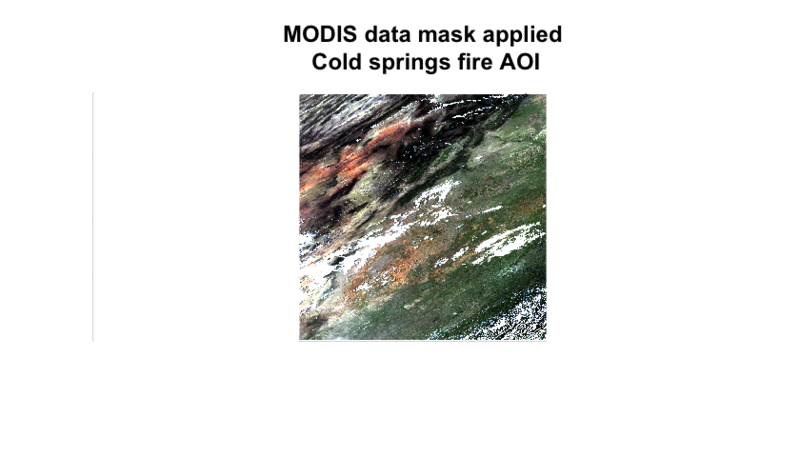 The metadata for the MODIS data are a bit trickier to figure out. If you are interested, the link to the MODIS user guide is below. The MODIS data are also stored natively in a H4 format which you will not be discussing in this class. For the purposes of this assignment, use the table above to assign cloud cover “values” and to create a mask. 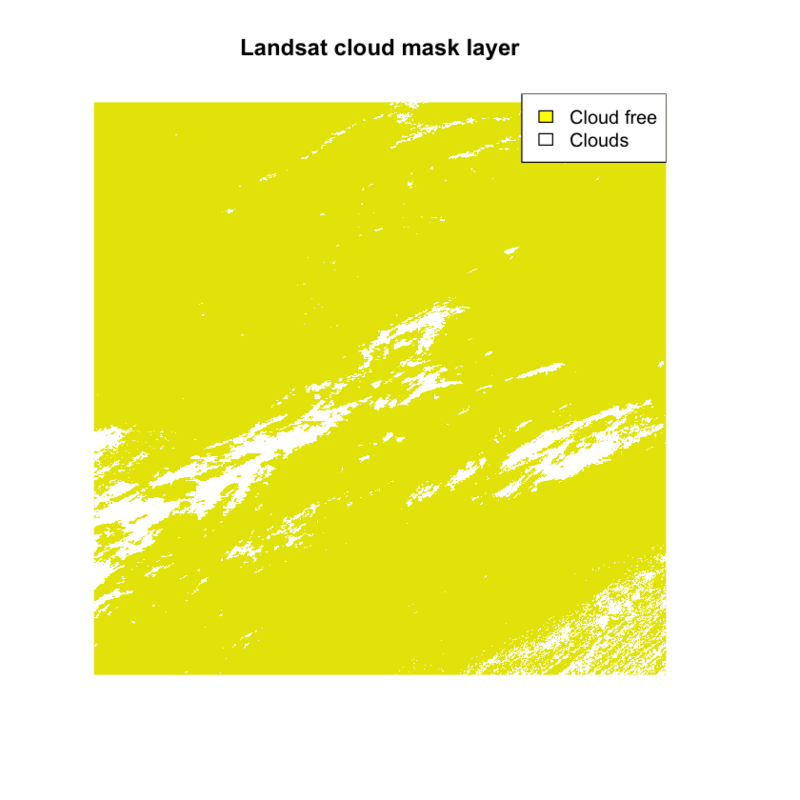 Use the cloud cover layer data/week-07/modis/reflectance/07_july_2016/crop/cloud_mask_july7_500m to create your mask. Set all values >0 in the cloud cover layer to NA. Plot the masked data. Notice that now the clouds are gone as they have been assigned the value NA. 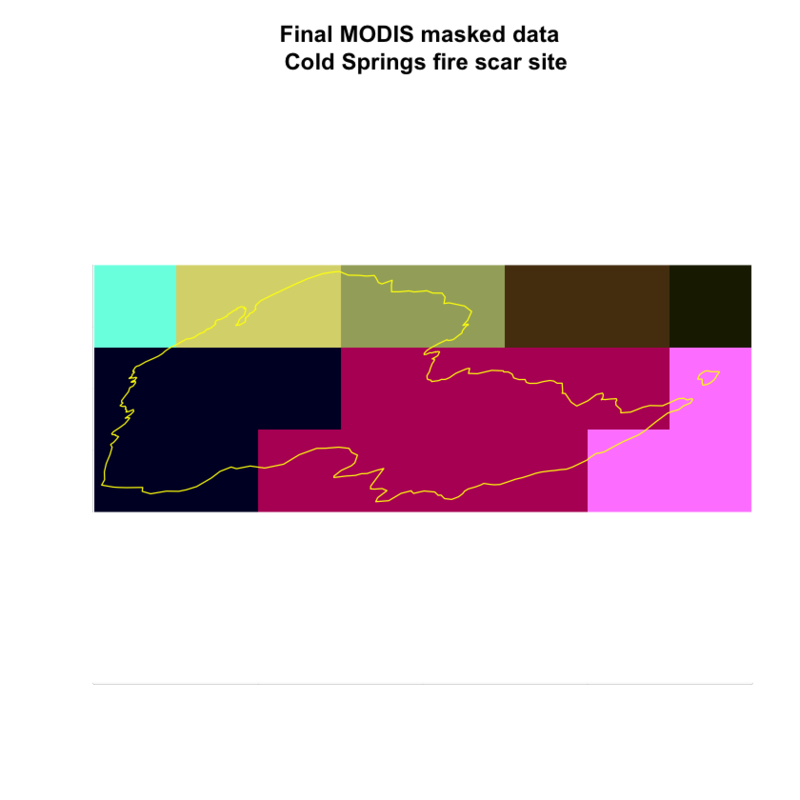 Finally crop the data to view just the pixels that overlay the Cold Springs fire study area. Once you have the data cleaned up with cloudy pixels set to NA and the scale factor applied, you are ready to calculate dNBR or whatever other vegetation index that you’d like to calculate. Figure out what bands you need to use to calculate dNBR with MODIS. Classify the data using the dNBR classification matrix. 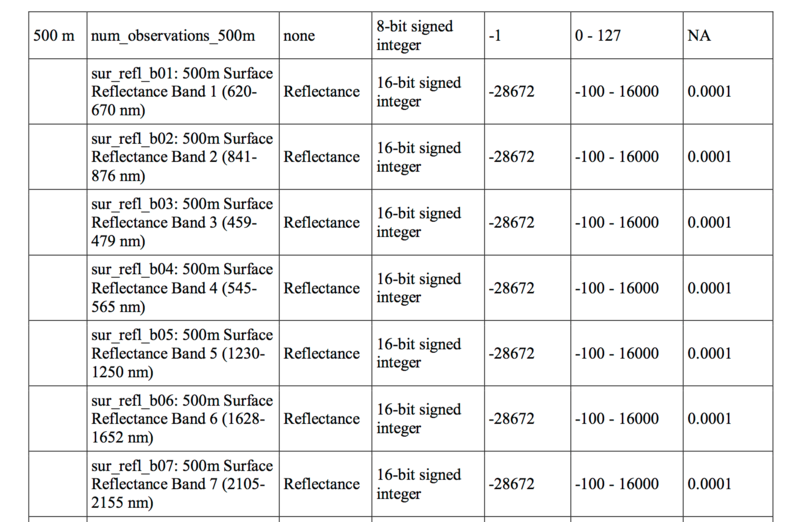 The table below shows the band ranges for the MODIS sensor. You know that the NBR index will work with any multispectral sensor with a NIR band between 760 - 900 nm and a SWIR band between 2080 - 2350 nm. 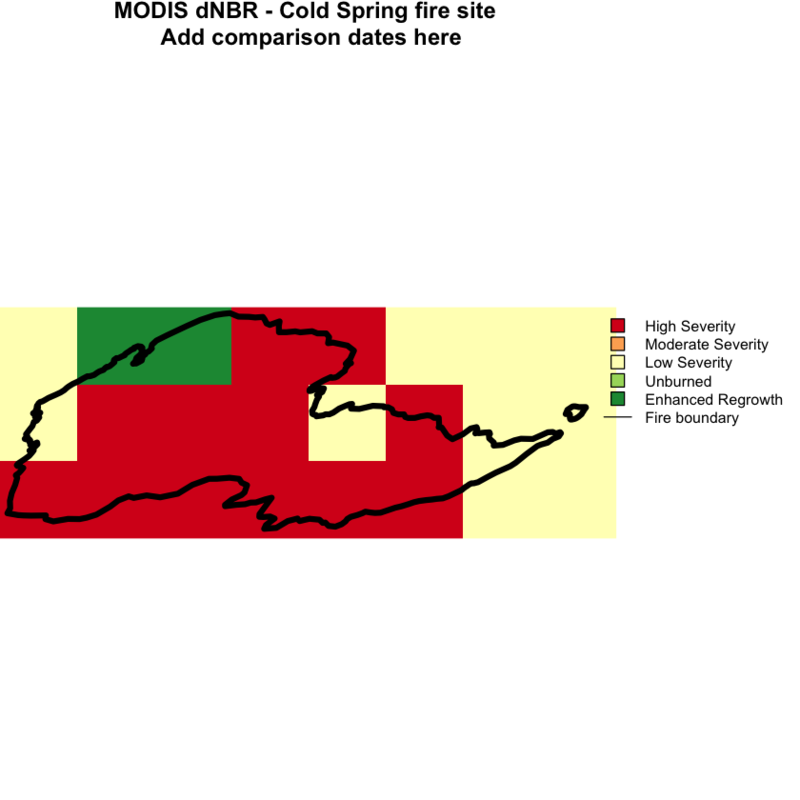 What bands should you use to calculate NBR using MODIS? 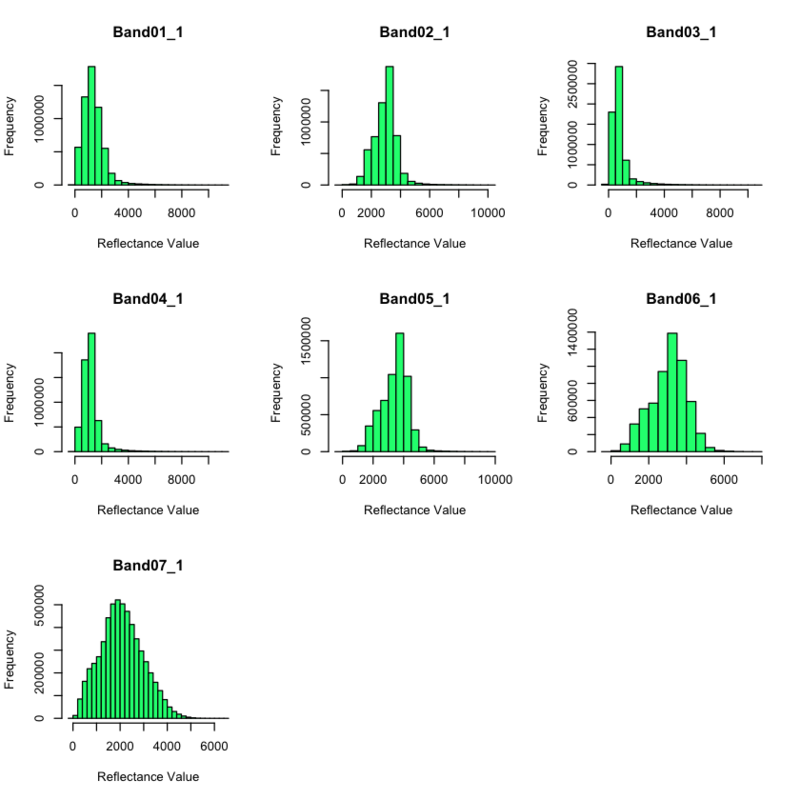 Finally calculate summary stats of how many pixels fall into each severity class like you did for the landsat data.